Coming from the heady metropolis of Walsall, I've been familiar with Bob Heath stuff since the mid 70's as I've always known them as a local firm. I have used their visor's for years and they have always been good value. 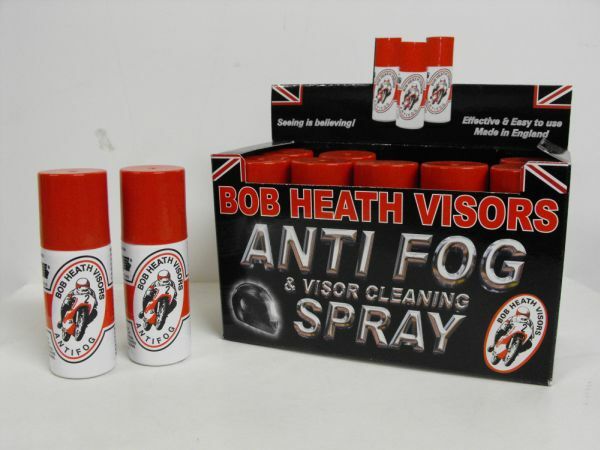 Here we have their anti-fog spray, this product is probably as old as the company itself.........however it in my opinion still ranks as THE spray to use to prevent fogging and misting on your visor. The spray is easy to apply as you just spray it on the inside of the visor and polish it up with a soft lint free cloth, I recommend one of those microfibre cloths, it does have quite a strong solventy smell when first applied so I recommend you don't stick your lid on straight away after using it as being as high as a kite doesn't mix well when riding. It can also be used on the outside and efficiently deals with all manner of road dirt including bug splatters in the summer if you let it soak a little. I tried this on my visor just before going out in the hideous Winter rain - you know the sort, the type of rain that washes the Lake District away. Most of my journey is also on unlit streets and lanes. I have to say that at no time did I get any fogging and that lasted nearly a week before having to do it again, very impressed! The same could not be said however for the outside which became rain soaked in no time at all (no fault of the Bob Heath spray)and required constant wiping - now I need some rain repellent - watch this space I'll tell you how I get on finding a good one. Click the picture at the top of the review to get some from our webshop, click the log at the bottom to visit Bob Heath's website. ACF-50......KILLS CORROSION ON CONTACT! ACF50 is a state of the art, anti-corrosion/lubricant compound, that was originally designed for the Aerospace Industry. It can be described as an ultra thin fluid film compound. ACF-50 actively penetrates through the corrosion deposits to the base of the cell where it emulsifies and encapsulates the electrolyte, lifting it away from the metal surface. ACF-50 then dispels this moisture and provides an atmospheric barrier which prevents any further moisture contact, thereby keeping the cell inactive. This compound continues to actively penetrate and "creep" into the tightest of seams, joints, micro cracks and around fastener heads, dissipating the moisture, even salt water, in these corrosion prone areas. These unique abilities of ACF-50 remain effective for 12 months, gradually disappearing as it is chemically consumed. Available in a handy aerosol it provides easy application, ACF50 contains no harmful CFC's. ACF-50 is an excellent penetrant. ACF-50 provides excellent low-shear lubrication to moving parts and cables. 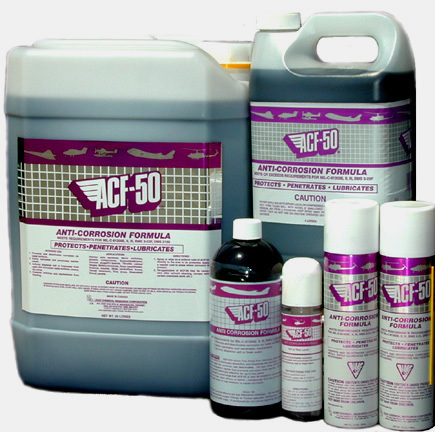 ACF-50 kills any corrosion currently in progress with just one application. Removal of the corrosion by-product is not necessary. ACF-50 is good for rubber, preventing it from cracking or drying out. In most applications, ACF-50's unique properties will last for 24 months before it is consumed and needs to be re-applied. The ultra-thin-film does not attract and hold road dirt or salt crystals. The ultra-thin film will not dry out over time. It remains as a flexible coating and therefore seals the surface better as the surface expands and contracts. ACF-50 will not displace or melt any grease which is already in place. It will mix with it and make it more efficient. ACF-50 will not support combustion so its good for those hot zones around the engine. Liberal application to your exhausts will produce some spectacular white smoke but it will keep some of its protection qualities, we recommend regular application in these areas. ACF-50 has a very low percentage of Volatile Organic Compounds (less than 17%) so its good for the ozone layer as well!! ACF-50 is non-carcinogenic and virtually non-toxic although we don't recommend drinking it as it does not taste very nice. Incidentally, full toxicology testing has been done to support this claim. ACF-50 can be easily removed with MEK or soap and water. ACF-50 will not harm any plastics or painted surfaces in fact we like to wipe the plastics on our stock of quad bikes with this and it gives a very pleasant shine as well as protecting them. ACF-50 can be safely applied to electronics such as radios, timers, test equipment, antenna connections, computers, etc. However, we recommend you avoid using it on LED's, LCD's and soft membrane switches. ACF-50 can be safely applied to electrical components such as alternators, starters, magnetos, generators, distributors, wiring, switches, battery terminals, light bulb sockets, electrical connectors, circuit breakers, ignition systems, wire harnesses etc. We found that the best way to apply ACF50 was to either directly spray onto the site being treated and then rubbed in using a cloth or applied liberally to the cloth itself and rubbed over the surface of the area with small squirts into those nooks and crannies ensuring full protection. It does not come out of the can particularly quickly which means little wastage when using. 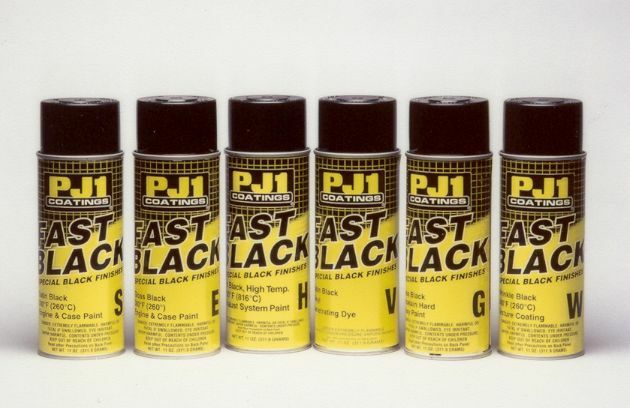 This product is seriously recommended if you want to maintain your resale value or preserve your classic machine. Secondly if you are a winter rider this is a must have to fend off all the British road crap coming your way. Are you sick of seeing your bike look like everyone else's? Tired of the same old mundane choices when it comes to aftermarket exhaust systems? Now S&S Bikes and Spares bring you something different! TAILGUNNER® EXHAUSTS delivers proven performance, a deep, throaty sound and classic styling. All TAILGUNNER EXHAUST models are available as direct-fit, bolt on applications for a variety of models be it American, European or Japanese. Engineered to enhance performance and sound, all models are crafted in America and flawlessly finished in show-quality chrome, polished stainless steel or a stem to stern Stealth-Black finish. What more could you ask for? Tailgunner® Exhaust makes it easy to be original. These systems are a definite must have if you like standing out from the crowd, the rotary cannon exhausts offer some performance increase whilst at the same time give a great sound and look to your machine. These barrels actually spin giving a great visual impression and combined with the exhaust note, the result is amazing - check this out!! They really do look and sound great on Harleys but these are just at home on Euro or Jap bikes as well and there are a set available specifically designed for Hayabusa's. Each exhaust can can be universally fitted on to most machines as slip fit adaptors are available to size down from the standard 2 1/2" inlet right down to 1 1/2" or metric equivalent so fitting them should not be an issue. One small downside for these pipes is that to get them to spin you need a good flow of exhaust gasses, I wouldn't recommend them for small bikes, however, Tailgunner also have a "Jetpipe variant which offers great looks resembling a jet engine exhaust nut with no spinning - here are some piccies. These would look and sound really special on most machines, not these are a high end item, don't expect cheap here in either construction or price but if you want to stand out from the crowd and gain some performance then these are for you. I personally love the rotary cannon versions but the Jet Pipes also look the business especially the 2 tone versions. Click the banner at the top of this review to get them from our Webshop or our Ebay Store and stand out from the crowd. The new Racetec with Interact™ technology tyre was launched earlier this year prior to the opening round of the ViSK British Superbike Championship at Brands Hatch. The patented technology and engineering behind the tyre is the result of a sustained Metzeler research project aimed for maximum grip and stability. Metzeler have developed new winding technology allowing for greater belt winding tension and zero degree windings. In short lower tension in the tread area creates more flexibility and the tyre can adapt itself better to the road surface, enlarging its footprint. High steel belt winding tension in the shoulder area ensures maximum and uniform pressure on the contact patch: the trajectory is therefore always precise, without any deviation. This gives far greater feedback and control when at near maximum lean angles. This is the fundamental principle behind its Interact™ technology. Metzeler enjoyed considerable success with these tyres at this years TT race in both the Supersport and Superstock classes demonstrating fantastic success in qualifying capped off with superb podium places and exciting lap times during the whole event despite some dramas with machine reliability, the tyres rated very highly. 4 Compound variants are available (3 for race and 1 for street usage). NOW S&S Bikes and Spares bring you the same super quality tyres, available in our webshop - check them out you know you want to.........! Click the picture at the top of this article to go check them out in our shop or click the Metzeler logo below to see their website. We recently came across the guys at Profi Products at a nearby trade show, they do not appear to be a particularly well known company compared to some of the bigger names but their products are certainly worth checking out!! Fuel Max is a treatment specifically formulated for motor cycles with or without catalytic converters, most fuel treatments have been developed for cars and do not work as well in high performance bike engines. You know the scenario, you put your bike up for the winter only to find in the spring that the fuel has gone off or your carbs are gummed up through a lack of use. Fuel Max conquers these issues by thoroughly cleaning out your fuel system from tank to combustion chamber in typically 15-20 miles of riding. Secondly, when added to fuel prior to storage it will stabilise your fuel in the tank preventing it from going off and preventing those spring time blues. I recently tried a can of this on my 1100 Katana which had been sitting sadly in my garage for 2 years due to a back injury I encountered. I put the bike back on the road last month and guess what..........it ran like a dog! I put a dose of this in the tank and re-filled it and within 20 miles I was back to running on all cylinders and the engine felt really smooth and responsive. Here's what they say "PDL is the unique, dry chain lubrication, which was developed particularly to take care of modern sealing ring chains. Our development of several years with many test kilometres has created a product, in which motorcycle drivers in the whole world trust. Whether in the sand of the Namibian desert, with top speed on German motorways or on racing courses of all kinds ... PDL works satisfactorily under all operating conditions. The special formula of the individual components ensures optimal lubrication and extends the life span of the chain set substantially." Over the last 30+ years I have tried chain lubes from pretty well all the main manufacturers e.g. Bel Ray, Putoline, PJ1, Castrol etc and its fair to say they have all been "alright", they lube the chain well, they also lube most of my wheel rim, number plate and tyre, regardless of how they claim to be clean and fling free, I have yet to see it - until I encountered this product! It is truly a clean fling free chain lube, using an advanced PTFE formula, it goes on clean, gets absorbed right into every nook and cranny of the links and then dries leaving your chain clean, lubed and weather resistant. Other lubes try to achieve a fling off resistant finish by going really thick and sticky and this brings me to their second downfall in that these other lubes by their very nature attract road dirt and grit onto the chain turning the whole thing into glorified grinding paste! This is clearly where Profi PDL scores 10/10 in that because it is clean, non sticky and dry the muck stays off the chain and your chain in ultimately protected. I have to say it has me converted, I would not put any other chain lube on my machine and I recommend you doing the same. Click on the banner above to get some now from our webshop, go on! you bike chain deserves it. I remember about 30 years ago NGK bringing out a new plug that changed spark plug design for motor cycles forever, for those of you old enough to remember that plug was the NGK V Plug. It came with a Gold/Palladium centre electrode of a fine wire design that was much smaller than a standard electrode. It was brilliant and made my old 250 fire and run like it should. Since then this has been the first thing I have changed on any bike I've owned. Out with the crappy standard plug as only losers use them and in with a set of V plugs because they are probably the "best bike plug in the world!" So lets come back to the present. I recently had need to change my once reliable V plugs on my 1100 Katana and found no replacements anywhere, disaster!! what to do now - it was then I discovered the Iridium IX, here's a little picture of how this baby looks. Hmm.....looks similar to my old V plug, better in fact. Doing a bit of research told me that iridium is not some sci-fi made up crap from planet Vulcan but a real metal related to the platinum family and is extremely hard and capable of resisting temperatures up to 2000 degrees and is typically found either in the Earth's core or in meteorites, so okay enough of the science bit. The centre electrode is only 0.6mm in diameter which offers increased ignite ability and flame kernel expansion in other words bigger fatter sparks and more robust fuel burning in the combustion chamber. This leads to better acceleration, more power and smoother running. I like all of those things so......in with the plugs. I have to conclude that these NGK Iridium IX live up to the hype, my Katana has started on the button and indeed seems to pull smoother through the rev range and even ticks over more evenly, I never thought my old favourites, the V plug, could be bettered but indeed they have, time will tell how they perform long term but initial impressions are that these are a definite MUST HAVE on your machine and certainly knock any standard plug into a cocked hat! Regardless of your machine be it Sports, Harley, Classic or even smaller engines there are a lot of benefits to be had here, so go get some. Click the NGK Iridium banner at the top of this review to go to our webshop. Click the banner below to view the manufacturers website.